5. Fernando Gaviria (col) s.t. 6. Arnaud Démare (fra) s.t. 9. Elia Viviani (ita) s.t. 10. Caleb Ewan (aus) s.t. From the gun 10 riders go on the attack. Frapporti, Maestri, Clarke, Skujins, Rovni, Marangoni, Poli, Zurlo, Amezqueta and Denz race to a lead of almost 5 minutes before the gap goes down to less than 2 minutes after the Turchino. Then gap widens to more than 5 minutes, which is the largest lead of the day. When the gap is down to less than 2 minutes Alexis Gougeard jumps clear of the front of the peloton, but he is brought back on Capo Berta. When hitting the Cipressa the early break is history. The pace is high and Cavendish is dropped. Around 1 kilometre before the top of the Poggio Sagan attacks, while Alaphilippe and Kwiatkowski re-join him moments before they plunge down. The trio arrives in San Remo with a 17 seconds lead. On the Via Roma Sagan opens fire. Kwiatkowski sticks to his wheel and pops up at the ideal moment to seize the first Monument in his career with Alaphilippe a narrow third. Read about the route of Milan-San Remo 2017. 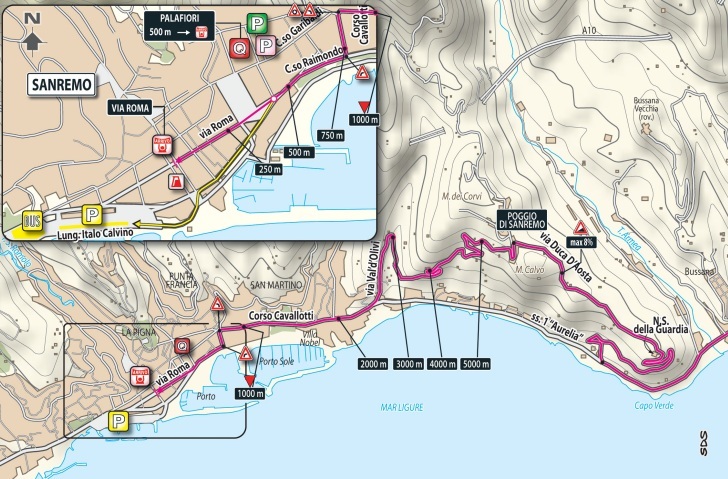 Milan – San Remo 2017: Route maps, height profiles, and more.